Although there are different parts of CVT transmission most commercial cars use a similar set up. Essentially a CVT Transmission operates by the working diameter of the two main pulleys in the transmission. How it works it that the pulleys have a V-shaped grooves in which the connecting steel belt rides on. 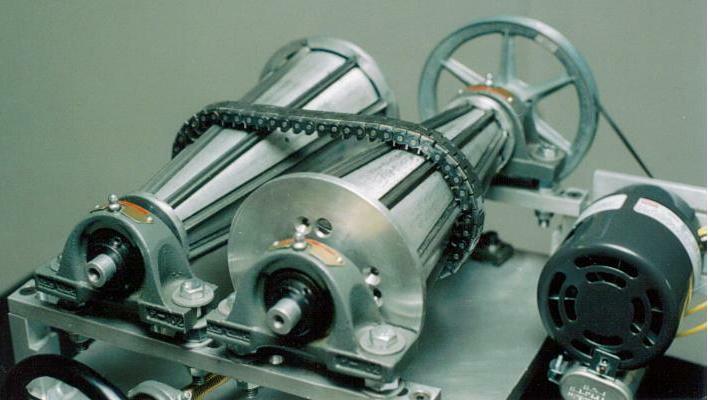 One side of the pulley is fixed while the other side is movable and is controlled by a hydraulic cylinder. The Cylinder can increase or decrease the amount of space between the two sides of the pulley. This allows the steel belt to ride higher or lower along the sides of the pulley wall, depending on the driving condition. This purpose is the same as a mountain bike shifting gears by going on the next sprocket except with a CVT transmission the gears are infinite with no steps in between. The step-less nature of the design is CVT’s biggest Success for Automotive Engineers. Because of this a CVT transmission can work to keep the engine at its optimum power range therefore increasing power when needed and fuel efficient if you’re easy on the accelerator. With these advantages its quite easy to understand why most manufacturers often use CVT Transmission in their car mostly because of its fewer internal components. The advantages of a CVT Transmission is that the engine does not develop constant power at all speeds , they have specific speed where torque, horsepower & fuel efficiency are at their peak levels. Because there's no gears in a CVT transmission the CVT can change engine speed as needed to access maximum power as well as maximum fuel efficiency. This allows CVT to deliver quicker acceleration compared to an Automatic transmission or manual transmission while delivering superior fuel economy. The Disadvantages of a CVT Transmission is in fact user acceptance. because a CVT allows the engine to rev at any speeds, the noises coming from under the hood sounds rather unusual compared to an Automatic transmission and/or Manual transmission. The changes in engine speed sounds like a slipping transmission which is perfectly normal in a CVT but it is signs out trouble in an Automatic transmission. When pushing the accelerator all the way in an Automatic transmission there's a sudden power burst but in a CVT Transmission it provides smooth rapid power increase when pushing the accelerator all the way through, the driver usually thinks a CVT Transmission is slower but it usually out-accelerates an Automatic transmission. Some Automakers of CVT transmission have tried making it feel like an Automatic Transmission while driving they've done that by setting up the CVT to creep when taking your foot off the brake this provides the same feel with an Automatic transmission. Some Automakers have made a CVT Transmission that offer manual mode that changes gears like a manual but without the clutch just like an "tiptronic transmission"
Early CVT Transmission were limited on how much horsepower they could handle, there's been concern with long-term reliability. Advanced technology has let Nissan create a CVT for their Nissan maxima, which can handle 290 horsepower. A CVT ( continuously variable transmission ) is a type of automatic Transmission that can change through an infinite number of gears. An Automatic Transmission has 4, 5 or 6 speeds while a CVT can constantly change the relationship of car speed or engine speed. While driving a vehicle with a CVT Transmission you will not hear or feel the constant gear changes it simply raises and lowers the engine speed as needed, calling up higher engine RPM ( Revolution per minute ) for better acceleration and lower RPMs for better fuel economy while cruising. A CVT Transmission delivers more usable power, better fuel economy & and a much smoother driving experience compared to an Automatic transmission. Finally a CVT Transmission does not strictly require a clutch in some motorcycles there's no clutch.